You're watching Detectorists, right, that BBC sitcom about the petty affairs of the Danebury Metal Detecting Club? If not, sort yourself out, pronto. Start with the first series, ideally, before jumping in to the just started new series now showing on BBC4. Stars Mackenzie Crook, him of the wonky PotC eye, and Toby Jones, him from Marvellous. Mentioned here, and I'm sure you're already ahead of me, since much of the filming takes place in Framlingham. Club members socialise at the Castle Inn, Lance's ex had a shop in the square, and last week's episode had Andy spying opposite the Lemon Tree. As Danny Baker said when interviewing MC on Saturday, watching Detectorists "is like taking off a tight pair of shoes." High praise. One part of town not yet glimpsed on the HD-ready is the roundabout by Charlie Simpson's Dad's estate agents, near the dead White Horse pub that Andy's all set to renovate. To the left, now Kitty's has croaked, there's the pretty good if awkwardly shaped Paddy & Scott's. To the right was a humdrum bakery. 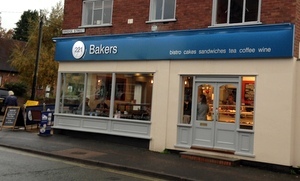 Well, that bread basket has now blossomed into 221B, an "artisan bakery & bistro", appaz. Artisan? Well, we'll see about that. Today's driver -- er, Andy -- has already been here a bunch of times and thinks highly of the place, not least for its generous opening hours. It's recently been demonstrated to me that I'm completely colour blind, so perhaps I'm not the best person to make the following observation: doesn't that blue-ish signage remind you of Gregg's? Lettering promises "bistro / cakes / sandwiches / tea / coffee / wine". Quick eye at the tapas board, offering meatballs and olives and shrimps and mushrooms, before a return to far more traditional light lunch fare. Double sausage and double bacon and a fried egg, por favor. One in a panini, one in a 221B woppa, the house roll. Away from the showery Suffolk skies, there's no shortage of assorted seating in this welcoming space. Sat with a can of Cawston press cloudy apple and tucking into an ADB busta-bap sure beats working. Best is yet to come since the array of what my mum calls "cakestuff" rivals the Woodbridge Cake Shop Bakery with croissants and Bath buns and tea cakes and scones and puffs and tarts and brownies and doughnuts et cetera. Pair of us are like middle-aged men in a cakeshop. I had the best chocolate eclair ever, so there. Freshness, size, texture, all mighty fine. Latte was OK, too. Gary, Mr Baker, is doing his utmost to emulate continental bakeries here, and I hope he's on to a winner. Never going to be as special as the unique Common Room up the road but it'll more than do. Go, Gary. If it was a car -- Yellow TR7. If they were passing by -- Pearce Quigley.